.....The Mark Humpal Fine Art gallery features examples of the finest paintings and sculptures produced by Oregon artists from 1860 to 1970. Tucked away in the bustling Sellwood district in Southeast Portland, the gallery strives to present works which capture the spirit of the Northwest experience. The historical background and significance of every piece is important to us as we endeavor to elevate the level of scholarship regarding the talented artists of this region, who often chose to work in an environment that stimulated artistic inspiration and vision at the expense of a more lucrative career in better-known art centers in America. .....Your visit is cordially welcomed whether considering a purchase or selling work that falls within our range of expertise. 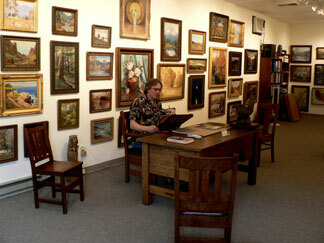 The gallery remains dedicated to all levels of collectors from beginning to advanced. Lighthearted browsing is always encouraged. We also gladly consult with museum curators and independent art scholars and researchers in addition to private collectors. Appraisals are also available and handled ethically. Mark Humpal, owner and director. Hours: Thursday through Saturday, noon until 6 pm.